You deserve the finest ammunition for your rifle hunting, so order this 20-round box of .300 Weatherby Magnum cartridges and you’ll be able to deliver reliable ballistics on deer, black bear, pronghorn, and other medium-sized game. 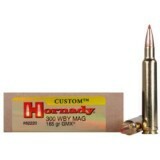 These 165-grain cartridges are so fast and powerful that they can even be used for larger game animals. These GMX bullets will come out of the muzzle with a scorching velocity of 3,140 feet per second and a devastating energy of 3,612 foot pounds. This gives you the ballistic performance to drive deep penetration and reliable expansion. Even when the bullet reaches 500 yards, it still has over 2,000 feet per second of speed and an energy of 1,681 foot pounds. When it comes to delivering effective performance in open-country hunting, these are the .300 Weatherby Magnum rounds you need. These bullets are an extension of Hornady’s rich tradition for premium hunting ammunition. This company started in 1949 by providing superior big game ammo and remains a popular choice for hunting, target shooting, and self defense to this day.